Melt the chocolate and coconut oil in a double boiler. Let melt slowly and stir constantly to avoid burning the chocolate. Remove from heat when the chocolate is just fully melted. Beat in the maple syrup, water and salt. Beat in the eggs, one by one, until completely incorporated into the mixture. I used the electric whisk attachment for my hand blender. Grease a 9″ springform pan and dust it with cocoa powder. Surround the base of the pan (on the outside) with foil. Pour the cake batter into the pan. Cook in a water bath reaching halfway up the side of the cake. Bake at 275 for 50 minutes. 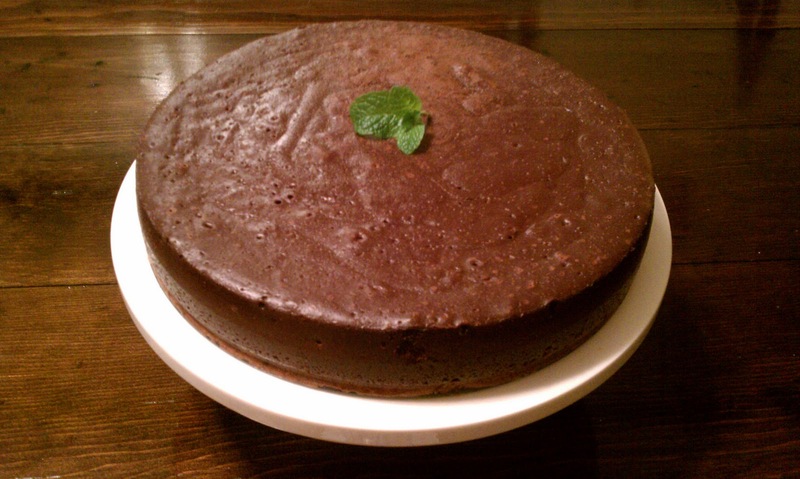 Cake should be set, but still look a little shiny and wet in the middle when done. Let cool at room temperature for about an hour, then refrigerate 5 hours before removing pan siding and serving. Cut with a clean, warm knife (run the knife under hot water and dry between slices). Get creative- add walnut pieces or an almond butter squirl before baking. Serve with fresh raspberries and garnish with a fresh mint leaf. 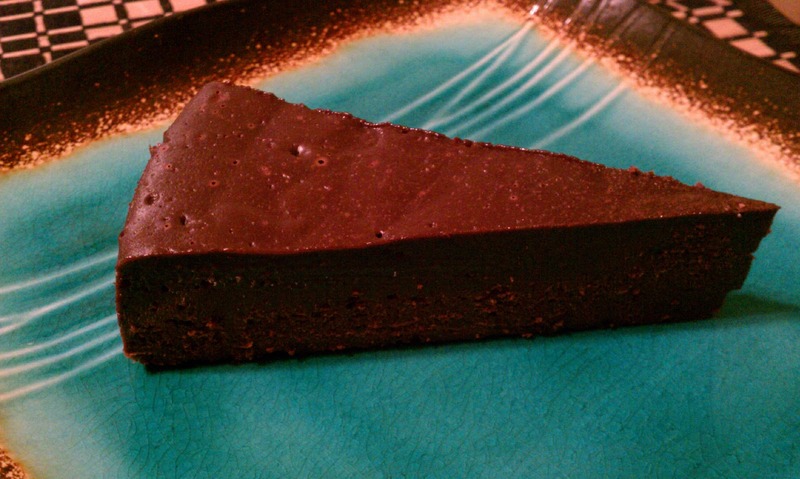 This entry was posted in chocolate, chocolate cake, dessert, paleo, paleo desserts by Jessica. Bookmark the permalink. >What a luscious looking cake. It sounds so rich but I bet it goes great with a scoop of vanilla ice cream. I have a new linky on my blog every Saturday called "Sweets for a Saturday" and I'd like to invite you to stop by this weekend and link this up. >Yes Lisa! Please feel free to link this page to your site. Hope you enjoy this recipe… I sure did! >Cannot wait to try this recipe!! Jennifer said I needed to check for this post! >Came out like fudge. But delicious!!!! Loved it. Thanks! Looks amazing!! Do you know how far in advance this could be made? I think I would be comfortable making it up to two days in advance. That being said, I have eaten these leftovers for a week! Just keep it refrigerated, then let it sit on the counter for a hour before serving. Place the cake pan in a larger pan, then place in the oven. Use a cup to pour cool water into the larger pan before closing the oven door. Be careful not to splash water on the cake batter. 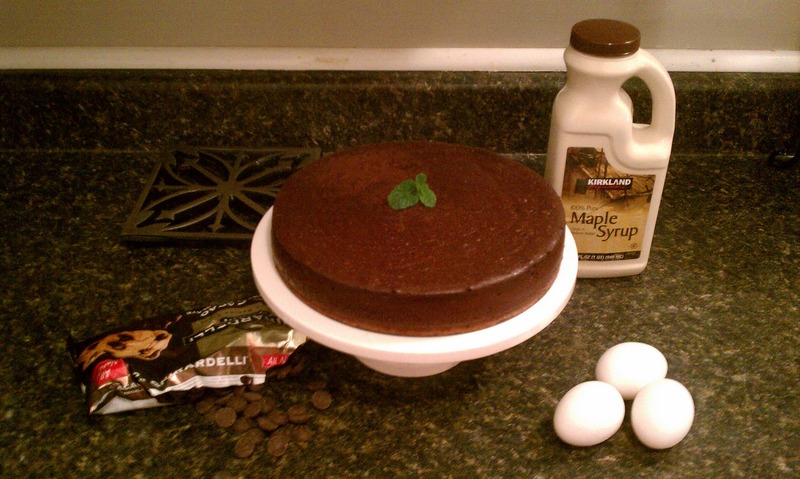 The water bath allows the cake to cook gently and evenly, without burning the chocolate or overheating the eggs. The cake will cook the entire time in the oven in the water bath. Hope this helps clarify for you! My daughter-in-law made this, and it was wonderful. But it took a lot longer to bake than the 50 min. indicated. Have others had to leave it in the oven longer than 50 min? Or used a higher temperature setting? Yes, I had to bake it for about 70 minutes at the same temperature. I’m glad to see that you had this problem too. I just set the timer for another ten minutes, because the batter looked completely raw. amazing! I just made this, and in regards to the comments of it taking longer than the recipe suggest, you might consider putting the water bath in the oven as it heats up so the water is already warm. Otherwise the water has to warm in the oven and then begin to cook the cake. I used a baking stone pan for the water bath, which takes longer to heat up and I didn’t think till after to preheat the pan and water. Just a thought 🙂 thanks for the awesome recipe! I am currently cooking a small test batch of this recipe. I’m making it in foil baking cups as I want to use it for my daughter’s 5th birthday party on Sunday. Licking the batter of the spoon it tasted awesome! My only concern now is I forgot to add the water to the batter — any thoughts on that omission? Also I didn’t grease the cups because they’ll be presented as individual servings already — curious to see how that will work out. I think it will still taste the same, but may be extra thick with the omission of water. Also, lots of people have commented on needing to cook this a little longer. This may be due to variety of ovens used, but most likely slightly over cooking the cake. Remember, the cake still has to cool in order to completely set, so it should be glossy and wiggle a bit in the center when you take it out of the oven. Good luck with the party! I hope everyone loves the Flourless Chocolate Cupcakes! Have you ever tried substituting something like Truvia for the maple syrup? I agree – how about apple sauce or pumpkin? Neither are able to be tasted after it’s cooked and it might cut down on an egg or two. Is the oven temp in Fahrenheit or Celsius, i want to cook it tonight for my son’s birthday tomorrow? It is in Farenheit. Enjoy! thank you Jessica, I looked up similar recipes and allowed it slowly cook for 70 minutes. Took it out of the fridge this morning and smells awesome. I think my son is appreciating my efforts. This looks amazing! Do you it would be possible to substitute unsweetened chocolate and more maple syrup for the 18oz bittersweet choc? If so what proportions would you recommend? I’m sure that would be a fine substitute, but I’m not sure how much maple syrup to add. If you look on a package of unsweetened baking chocolate, I think sometimes there is an approximate amount of sugar to add for semi-sweet or bittersweet chocolate. Hope that helps! Thanks Jessica! Your suggestion worked out great. I used about 10 oz of unsweetened choc, 1.5 cups maple syrup and it came out a lovely bittersweet. i wonder if separating the eggs and putting the yolks in first and then folding in separately whipped egg whites (from the 6 eggs) would make the cake fluffier? 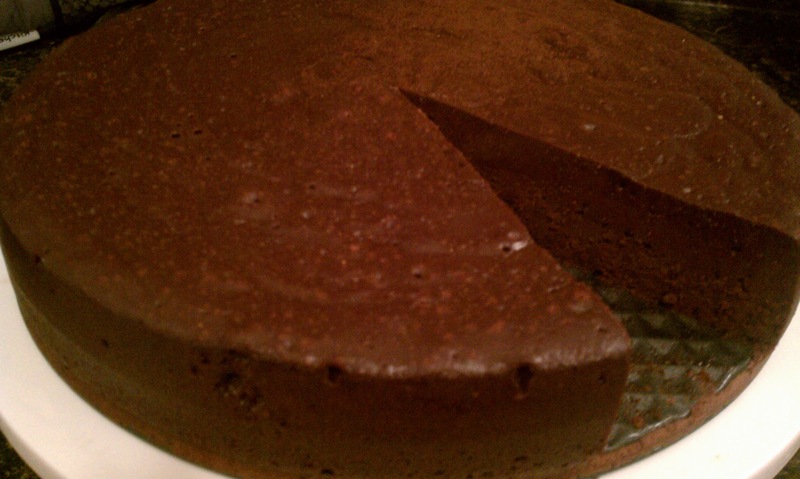 I’ve seen non-paleo flourless chocolate cakes dones this way but not sure if it would change the texture of this recipe. I’m not sure. It’s not meant to be a fluffy cake. This recipe is more fudgey. Hi Sarah. Glad to hear you liked it! Easiest way to add the almond butter swirl is to put about 1/2cup of almond butter in a ziploc bag (or pastry bag if you have one). After pouring the batter into the pan, add the almond butter by cutting a very small hole in one corner of the ziploc bag. Squeeze the almond butter in a swirl pattern into the pan. Use a dinner knife to cut the almond butter into batter. if i don’t have a spring pan, can i use a regular pie baking pan? would the cooking temp and time be the same?? What are your thoughts on using 1/2 c. agave instead of 3/4 c. maple syrup? Also, wondering about adding some hazelnut and chocolate liquor… How much would you add?And do you think this would be a good idea or do you think it would mess with the texture? I would add the liquor at the eand of all the mixing. I say about 2 tbsp will give you a hint of alcohol where 1/4-1/3 cup will be very nice almost boozey. I would go with 1/4 of frangelico. To make the cake less dense try a slightly different method of mixing the cake ingredients. Take a double boiler and melt the coconut oil and chocolate together. Separate the egg yolks from the whites. After the chocolate is melted, add a tiny bit of chocolate to the yolks and whisk together to temper them. Do this again until the yolks come up a little in temperature. Adding all the chocolate at once will cook the eggs. Add the remainder of ingredients to the chocolate mixture, leaving egg whites on the side in a clean bowl. Whisk the egg whites to medium-soft peaks. Slowly fold the whites into the chocolate mixture in three stages. Do not over mix!!! The whites will give you the lift inside your cake. Bake as directed. Enjoy!!! tried to make a double batch tonight, but it didn’t seem done after 50 minutes. cooked again for another 30 minutes, but now the sides have few cracks. not shiny and solid like last time. any suggestions on cooking time for double batches next time? also using semi sweet chocolate instead of bittersweet, came out pretty sweet last time, wondering if i can use less maple syrup? This was amazing. My mother-in-law made this for my birthday since she knew I was following the Paleo lifestyle. Delish! I made this and it came out perfectly! Not having a spring-form pan, I lined a 9 inch round with aluminum foil and greased and dusted the aluminum foil with cocoa. I melted the coconut oil and chocolate chips in the microwave. I whipped the whole eggs in the stand mixer and gradually added the chocolate chips/coconut oil/maple syrup into the eggs. Great recipe! I substituted really strong coffee for the water for a little extra flavor nuance. Just made this last night. Amazing! RICH and MOIST. I poured boiling water in the outer pan for the water bath (as I found on a Youtube video) and 50 minutes worked just fine. Made a raspberry sauce and served with raspberry garnish. Yum! I substituted 3/4 cup of Just Like Sugar in place of the maple syrup, and the cake came out delicious but dense and thin like a torte. I’ll add more liquid next time to dissolve the sweetener and maybe increase the chocolate, egg and oil ingredients to help fill the 10″ springform pan I have. that were easier to hunt or gather in this region. Alcohol directly metabolized in fat in the liver. It is full of flavor and spices and will be a big hit at any dinner or summertime event. of food), one or two of red beans around the rice stew with rice or barley;. Do you think seedless Polaner all fruit blackberry and raspberry liquor could be substituted for the syrup and water? What proportions? I am thinking it would turn out like a raspberry truffle cake. Also have semisweet choc. chips rather than bittersweet but could go buy some before making this one. I just always have semisweet in the pantry.